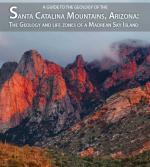 a non-technical treatment of the geology and ecology of the Santa Catalina Mountains outside Tucson. The report is available for free viewing and downloading at the AZGS Document Repository at http://repository.azgs.az.gov/uri_gin/azgs/dlio/1679. The Natural landscapes have distinctive personalities. 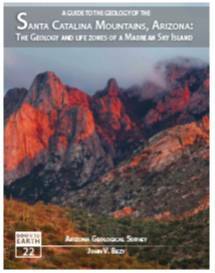 Each is the product of the interplay of geology, climate, vegetation, time, and often, human activities. The landscapes that form the Santa Catalina Mountains of southeastern Arizona give that range a unique personality like no other in the American Southwest. Rising as a great mountain island to over 9000 feet in elevation at their summit, Mount Lemmon, the Santa Catalina Mountains are the greatest expanse of high country within the Sonoran Desert. An unusual dome-like profile sets it apart from the numerous, steep, sharp-crested mountain ranges in the region. This distinctive profile is a legacy of the range’s remarkable geologic history and the structure of its bedrock. Formed miles deep within Earth’s crust before being exhumed, this ancient structure has guided surface weathering and erosion for millions of years. The result is a mosaic of mountain landscapes of singular beauty and complexity.